• Dry roast almonds for 2-3mins and add cumin seeds, fenugreek seeds until slightly golden, transfer it to a plate and blend to a fine powder as it cools down and set aside. • Heat oil in the pan add chopped onion, tomato, chilli, tamrind pulp and saute for 5-7mins stirring in between. • Add salt, sugar, red chilli powder mix well and cover and cook for 5-7mins more and as the tomatoes are mushy turn of the flame and let it cool down. • Add chopped methi leaves and saute until the raw flavour of the leaves goes off and then add the ground tomato puree, ground powder mix well and simmer 4-5mins. Serve hot with rice/ chapathi/dosas. Posted on June 11, 2014, in Dips, Indian and tagged chutney, Dips of India, drchdietfood, Indian recipe, Methi, Tomato. Bookmark the permalink. 8 Comments. 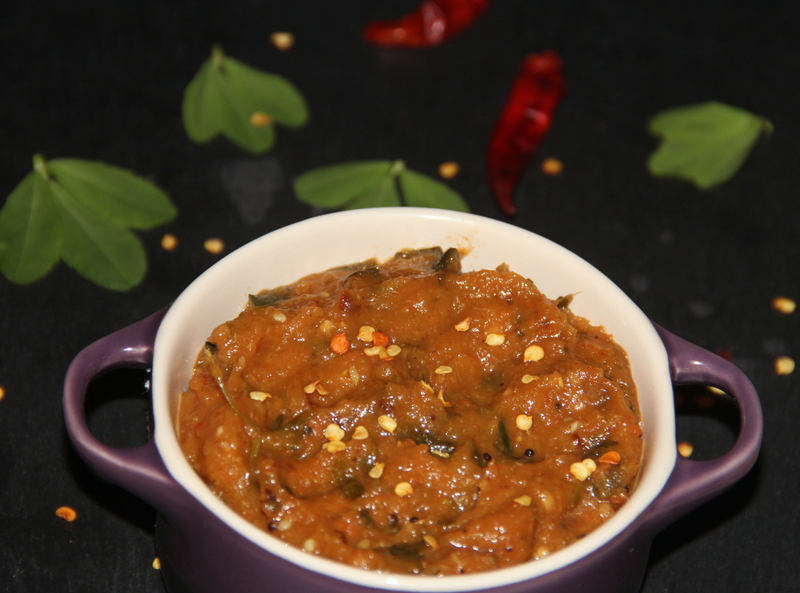 I really want to try chutney at some point… This looks great!